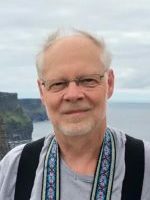 Gordon passed away Wednesday, January 23, 2019 at his home in Alamo Township. He was born August 25, 1952 in Kalamazoo the son of Robert and Florence (Blue) Snow. Gordon was a 1970 Otsego High School graduate. He had worked at Upjohn/Pfizer for over 30 years until his retirement in 2006. In his spare time Gordon enjoyed photographing wildlife and landscapes and hunting. Surviving are his son, Jared (Stephanie Zohn) Snow; mother and step-father, Florence and Berle Finkey; brother, Paul (Teri) Snow; nephew, Nathan (Kallin) Snow and their daughter, Avery Snow and his niece, Caitlin (Justin Nolan) Snow. He was preceded in death by his father, niece, Amanda Snow and by his dogs, Chase and Boo Boo. A memorial visitation will be held from 4-6 P.M., Tuesday, January 29, 2019 at the Winkel Funeral Home, Otsego with a time of sharing starting at 6:00 P.M. Contributions in memory of Gordon may be made to Backcountry Hunters and Anglers or Theodore Roosevelt Conservation Partnership. Our most sincere condolences to Gordy’s entire family. It will not be the same to not see him walking around our neighborhood. We are so sorry to learn of Gordon’s passing. Our deepest sympathies to his loved ones. We will pray for strength and comfort for the family. So sorry, praying for the family. Dear Florence and Paul, I was saddened to learn of Gordy’s passing. He was a great friend throughout our time together at Otsego High School. I have many great memories of our time together in band, sharing many classes with Gordy, riding in his “Super fast Chevy” , and sharing hunting stories. Most of all, he was just a great, and kind person that we’ll all miss deeply. May God comfort you and your family. I would like to offer my condolences to Gordon’s family at his passing. Paul, you know that I am thinking and praying for you at this time. I’m so sorry to hear of Gordon’s passing. My prayers are for the family. I am saddened to read of Gordon’s passing. I was his neighbor for many years. He was a good conservator of his woods and was a nice, quiet neighbor. It was always good to see his familiar figure on the Kal Haven Trail. My sincere condolences to his family. So sorry to hear of Gordy’s passing. He was a great lab partner and trainer and above all one of the nicest guys I have ever known. Our sincere condolences and prayers to the Snow family. Dave and I want to express our sympathy for the passing of your brother. I know how close and special your brother was to both you and Teri. We are praying for peace for all of you. We are so sorry Florence and Paul to hear of the passing of Gordon. We went to Alamo Congregational Church with you. Gordon was such a nice young man. I never knew him as an adult but his love of photography make me wish I had seen his work.